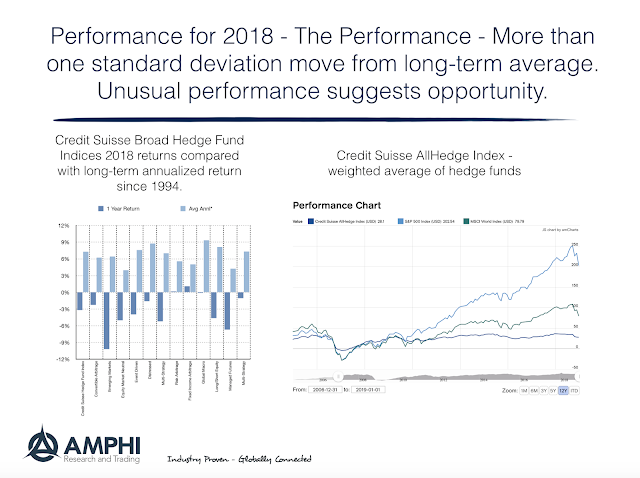 What happened to alternative risk premia returns in 2018? This was a major discussion topic at a UBS risk premia conference last week. It was a difficult year. In fact, it was a the worst performance year since 2008, and the decline for many strategies was a multiple standard deviation event. Yet, there is a good opportunity for investors who focus on the longer-run. Since the performance for many risk premia seemed unrelated to macro factors, there is strong potential for mean reversion to longer-term strong positive performance. To extrapolate recent performance as representative of history would be to fall into a recency bias. The talk of alternative risk premia extremes started well before year-end. See "Alternative Risk Premia: Crisis or Opportunity?" by Michael Aked, CFA, Brandon Kunz, and Amie Ko, CFA of Research Affiliates. Using their categorization for hedge funds, we find that their analysis and conclusions through November does not change when analyzing the full year. It is notable that January was a major reversal of the earlier negative extremes. 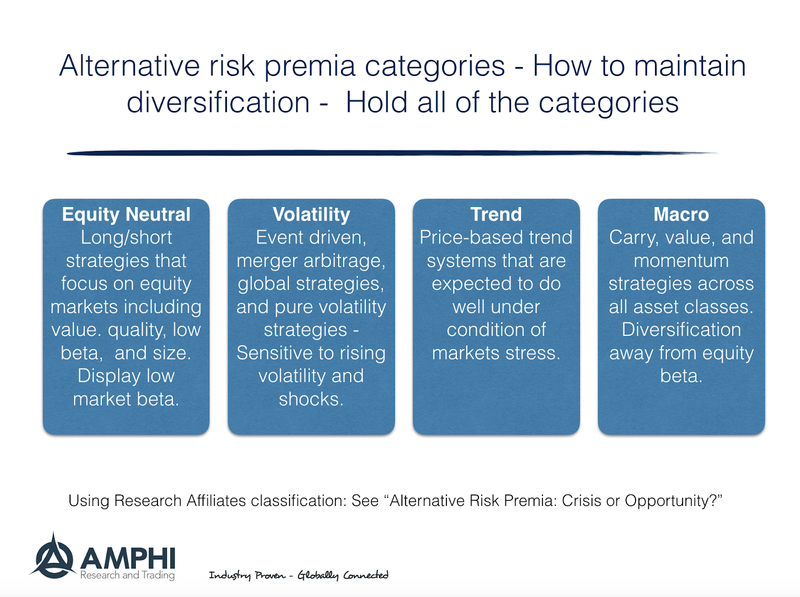 Research Affiliates breaks alternative risk premia into four major categories: equity market neutral, volatility, trend, and macro. Investor should consider ensuring diversification across these categories other classification schemes. The equity neutral category focuses on long/short strategies that have low correlation with market beta. The volatility category is sensitive to increases in volatility because of embedded optionality. The trend category is viewed as a defensive strategy that will do well during market disruptions. 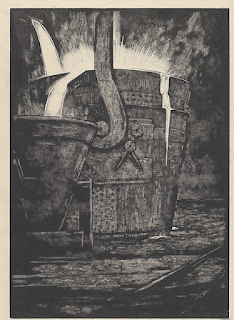 The macro category focuses on strategies across asset class such as carry, momentum, or value that will have low correlation with equity returns. 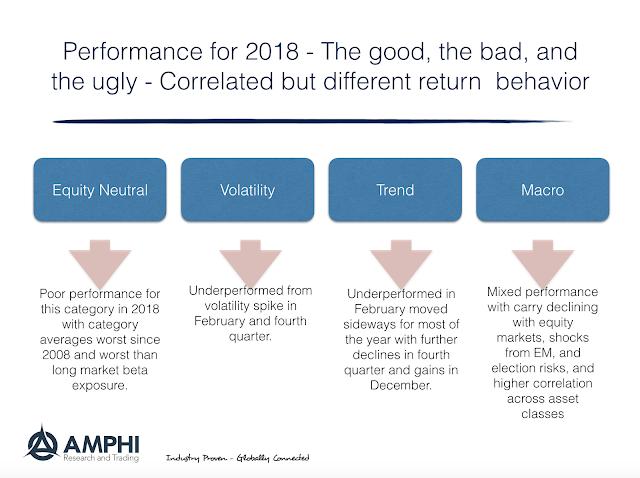 Each of these categories underperformed in 2018, but for different reason. The equity neutral category showed increased correlation with market beta and was dragged lower by dislocations in the value style sector. The volatility category was hurt by spikes in volatility during February and the fourth quarter. Trend was harmed by volatility spikes and limited or choppy trends until December. Macro strategies that have an equity bias like carry were hurt during the year and shocks to both global and emerging markets negatively affected overall performance. 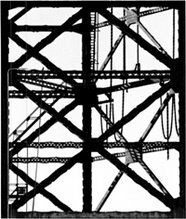 Any shock to risk premia performance is a wake-up call and should not be dismissed as just an aberration. 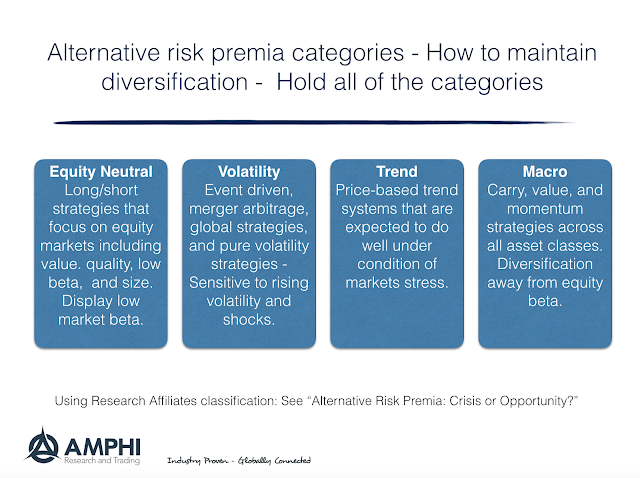 2018 proved that alternative risk premia are not immune to market disruptions, but an over-reaction may also be viewed as an opportunity to reset or reengage with these styles and strategies. Clearly, January proved to be a significant offset to fourth quarter loses.